The City of Ridgeland Water System has earned a maximum score of five from the Mississippi State Department of Health. The City’s Water System is rated in the top five percent of all water systems in the State with over 1,800 systems evaluated. System evaluations are based on technical, financial and managerial criteria. Ridgeland’s water source is two deep-water supply wells in the Cockfield Aquifer and four deep-water supply wells in the Sparta Aquifer. The City of Ridgeland routinely tests for contaminants in your drinking water. Please help us to protect our water sources as well as report any leaks and contamination of the system by contacting the Public Works Department. The City of Ridgeland produces an annual Water Quality Report 2016 that reveals water quality test results and information about the city’s water quality services. Water and sewer rates increase 2% each year on January 1 per Ordinance #200201 adopted on February 5, 2002. On December 19, 2006, a new ordinance was passed that increased utility rates in order to help pay for a new water well, upgrades to existing water lines, and improvements to the sewer system. Water, sewer and garbage rates increased effective February 1, 2007. The annual 2% rate increase was deferred at that time until 2008. 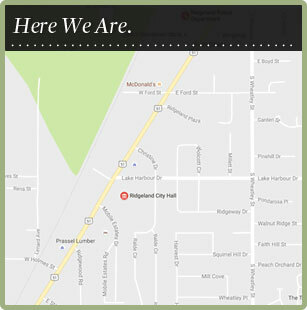 The water and wastewater facilities plans for the City of Ridgeland are available for public information. These resources provide system planning information and recommendations for new facilities and improvements to existing facilities including why the facilities or improvements are needed, where they will be located, and costs. For any questions about water and sewer services, please contact Mike McCollum at 601.853.2027 or mike.mccollum@ridgelandms.org. For after-hours water and sanitary sewer emergencies, call 601.856-2121.